This is a gorgeous vintage 1971 Loma (Holland Mold) hand painted and crafted ceramic teapot with matching sugar bowl w/ lid, creamer and salt and pepper shakers. Note: One of the shakers does have a small crack and a small hole at one of the original holes so the set is being included free. The original stoppers are also missing. They are still fine for display. 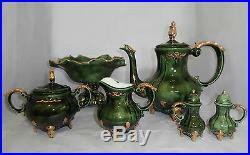 The teapot, sugar bowl, and creamer are all in excellent condition with no chips, cracks or crazing. There are two colored marks on the under side of the sugar bowl lid, as seen in the photo provided. This set has been painted in a beautiful glossy evergreen with gold trim. I have not found another like it. The teapot measures 12″ tall, from the bottom to the tip of the lid and is 12 1/2″ wide, spout to handle. Creamer measures 5 1/4″ tall x 5 1/2″ wide, including handle. The gut itself measures 4. The sugar bowl measures 7 1/2″ handle to handle with the bowl itself measuring 4 3/4″. The item “VTG 1971 Loma-Teapot-Creamer-Sugar-S&P-Victorian-Green/Gold-Fruit Bowl Separate” is in sale since Wednesday, July 8, 2015. This item is in the category “Pottery & Glass\Pottery & China\Art Pottery\Other Art Pottery”. The seller is “lisag109″ and is located in Bowdon, Georgia. This item can be shipped to United States. This entry is filed under loma-teapot-creamer-sugar-sp-victorian-greengold-fruit and tagged bowl, loma-teapot-creamer-sugar-sp-victorian-greengold-fruit, separate.